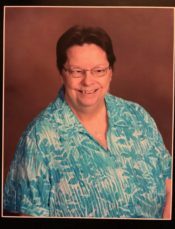 Jacquelyn R. Davis, 66 of Pensacola, Florida Passed away on November 22, 2018. She was born in Houston, Texas and resided here for 52 years. Jacquelyn attended Pine Forest Methodist Church and enjoyed collecting antiques, rooster memorabilia and snow globes. She also enjoyed Genealogy. She is preceded in death are her parents, Arthur and Pearl Rogers; brothers, Mike Rogers and Carl Rogers. Jacquelyn is survived by her sons, Jason Davis (Tracy Aaker), John Davis; brother, David Rogers (Russet Rogers); sister, Joanna Ciesielski (Daniel); granddaughter, Rhiannon Davis; and numerous Aunts, Uncles, Cousins and In-laws. A memorial service will be held at Pensacola Memorial Gardens on Monday, November 26th at 10:00 AM. In lieu of flowers, please donate to a charity of your choice. I’m so sorry to learn of Jackie’s passing. She was a wonderful neighbor and friend.